Prepare rice as directed on package. While rice cooks, shred 2 cups of chicken from rotisserie. Set aside. Heat 1 tablespoon oil in a wok or large skillet over medium heat. Whisk eggs and add to hot skillet. Cook and stir to scramble. Once fully cooked, approximately 2 minutes, remove from wok. In same wok, heat additional tablespoon of oil. Add frozen mixed veggies (no need to thaw) and snow peas. Cook for 3-5 minutes, until thawed and heated through. Add rice, chicken, eggs, and soy sauce. Stir to combine, and cook for 1-2 minutes longer or until hot. 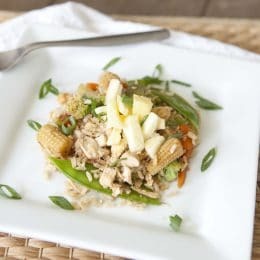 Serve topped with chopped green onions and pineapple chunks.